Chyromyidae are small to very small cyclorrhaphous, acalypterate flies (Diptera) currently classified within the Heleomyzoidea by most authors. The majority have a pale yellow integument and bright iridescent green, red or purple eyes. The family is represented in all continents except Antarctica. There are about 150 named species in this family worldwide. There has been no comprehensive taxonomic study to elucidate the generic limits of species in the family. Currently, only four genera are recognised, but ongoing studies of the African species indicate that there are more. The biology of Chyromyidae is poorly known and no life history of any species has been elucidated. Adults are xerophilic and have been collected on flowering plants. There appears to be some association with bird and mammalian nests, though the nature of this association is not clear. Some species have been reared from guano and dung, from debris in tree hollows, and bird and mammalian nests. ↑ Wheeler, T.A. & Sinclair, B.J. 1994. Chyromyidae (Diptera) from the Galapagos Islands, Ecuador: three new species of Aphaniosoma Becker. Proceedings of the Entomological Society of Washington 96 (3): 440–453. ↑ Ebejer, M.J. 1996. Chyromyidae (Diptera: Schizophora) from the Arabian Peninsula with descriptions of twelve new species. Fauna of Saudi Arabia 15: 280–299. ↑ Ebejer, M.J. 1998. A new species of Gymnochiromyia Hendel (Diptera: Chyromyidae) from the Mediterranean, with notes, lectotype designations and a key to the species from the West Palaearctic. Studia dipterologica 5 (1): 19–29. ↑ Ebejer, M.J., 1998. A review of the Palaearctic species of Aphaniosoma Becker (Diptera: Chyromyidae) with descriptions of new species and a key for the identification of adults. Deutsche entomologische Zeitschrift 2, 45: 191–230. ↑ Ebejer, M.J. 2000. Chyromyidae (Diptera: Heleomyzoidea). In: Kirk-Spriggs, A.H. & Marais, E., eds, Dâures – Biodiversity of the Brandberg Massif, Namibia. Cimbebasia Memoir 9: 261–264. ↑ Ebejer, M.J. 2008. New species of Gymnochiromyia Hendel, 1933 (Diptera: Schizophora: Chyromyidae) from Southern Africa. African Invertebrates 49 (1): 77-108. ↑ Ebejer, M.J. 2009. A revision of Afrotropical Chyromyidae (excluding Gymnochiromyia Hendel) (Diptera: Schizophora), with the recognition of two subfamilies and the description of new genera. African Invertebrates 50 (2): 321-434. ↑ Collin, J.E. 1933. 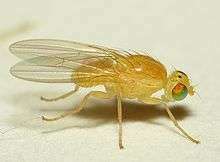 Five new species of Diptera. Entomologist's monthly Magazine 69: 272–275. ↑ Ferrar, P. 1987. A guide to the breeding habits and immature stages of Diptera Cyclorrhapha. Entomonograph 8 (1–2): 1–907. ↑ Smith, K.G.V. 1989. An introduction to the immature stages of British flies. Handbooks for the Identification of British Insects. Vol. 10, part 14. London: Royal Entomological Society of London, pp. 1–280.